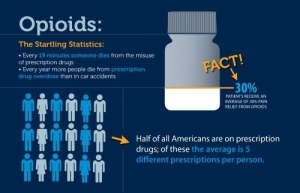 Opioids are one of the most commonly prescribed medications for pain. In pain management settings, as much as 90% of patients with chronic pain are on an opioid. 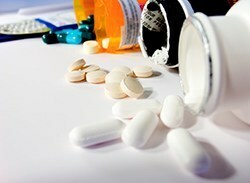 The use of opioids in the U.S. has exponentially increased–sales of hydrocodone increased by 244% from 1997 to 2006. Opioid therapy has been shown to be superior to placebos (no treatment) for patients being treated for non-cancer related chronic pain. Opioids bind to opioid receptors that are mainly found within the central nervous system and gastrointestinal tract (stomach and intestines). There are three types of opioid receptors: mu, kappa, and delta. The majority of opioid medications bind to mu receptors. Side effects of the medication are dependent upon which opioid receptor it binds to. When the medication attaches to the receptor it prevents pain signals from traveling from the peripheral nervous system to the spinal cord to the brain thereby preventing the perception of pain. The medication also promotes a signal to suppress pain and changes the limbic system in your brain that is responsible for certain behaviors, emotions, and memory. Opioids in general are used as an analgesic (pain reliever). A review of multiple studies published showed that approximately 23% of patients taking oral opioids discontinue therapy due to common side effects like constipation, nausea, and sedation but very few discontinued therapy due to severe side effects such as addiction. While dependence and addiction are separate, it is important to speak to your doctor to determine the differences. You should always be cautious about long term side effects, including addiction, and it is always recommended that you discuss the use of opioids with your doctor.